The screenshot above is hosted and provided by softinventive.com. Please contact them directly for any copyright infringement as we are not responsible for that content. Last Update: 2018-12-27 - Major Update: Network Map, Asynchronous mode of scanning SNMP devices and other useful new features, Many improvements, Huge number of fixes! Create a perfect, effortless, hassle-free inventory. The network inventory maker is able to scan all network devices no matter how large or diverse your LAN is! Do you know how many workstations still running Windows 95 or missing the latest updates? 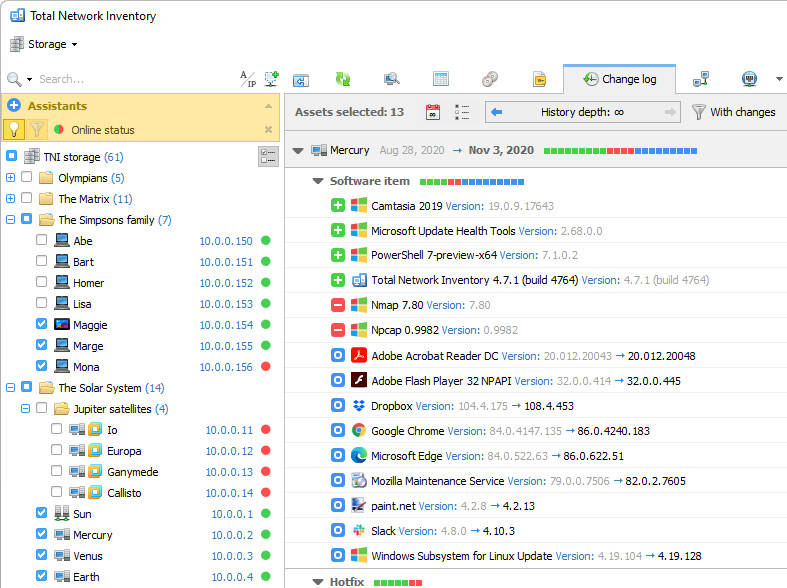 Total Network Inventory will get comprehensive information about each and every workstation on your LAN in real-time including data on all service packs and hotfixes applied. The network inventory builder will store and organize collected data, and provide you with a report on a chosen subject in just a couple of clicks. With Total Network Inventory, all information about your network components is right at your fingertips! Have a budget to plan for hardware upgrades? With Total Network Inventory, it's easy to discover the most outdated computers on your LAN. Just run Total Network Inventory, let it walk through your network, and click to generate a comprehensive network inventory report detailing equipment used in each and every PC on the LAN. Click once again, and you'll see the most outdated machines appear on top of the list. It's just that easy! Total Network Inventory can scan your entire LAN remotely, without you having to leave your chair or installing anything onto the PCs being probed. Using Total Network Inventory is safe and secure; no data will ever leave the LAN. Thanks to the step-by-step Scan Wizards, querying your entire LAN to make a network inventory is as easy as a few clicks. Detailed reports are easy to create and a pleasure to read, providing essential information about your network inventory presented in a simple way.